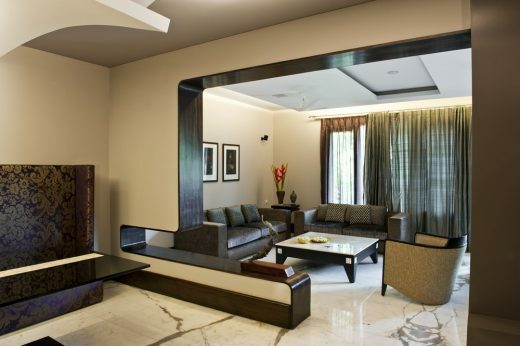 The house in question Is a 6,200 sqft, 4 level residence in Gurgaon, belonging to Mr. Vinod Verma and his family. 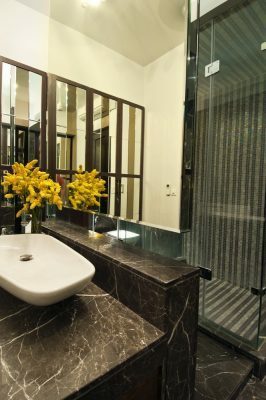 It has been designed by Amrita Gulta and Joya Nandurdikar of “Untitled Design and has recently won the zonal IIID – Anchor Award 2011. for excellence in Interior design. In the category of Residential Single Dwelling. As one enters through the enormous doorway, one Just cannot miss the huge hammered steel handle. 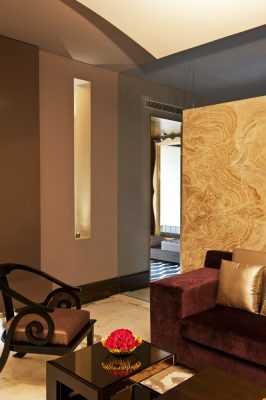 An exquisite chaise lounge clad with mirror, fabric and veneer greets one In the entrance lobby. 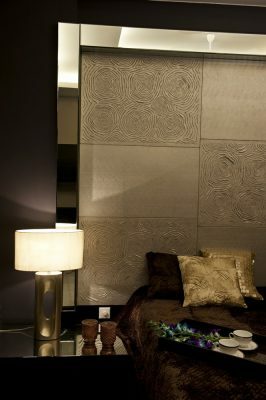 Black mirrored walls and striking art work sets the tone for the opulence that is about to follow. The most challenging bit of the house was probably the spatial planning. But, as the designers vouch. ‘It was also the most satisfying”. The house accommodates formal living room home -office, pantry and utility and the servant’s quarters in the which Incidentally has a basement, separate entrance. The ground floor has the dining room. Kitchen, den and bedroom. The mirrored ceiling, the four poster day bed, the opulent cabinet and interesting luminaries render the formal living room truly chic and sophisticated. 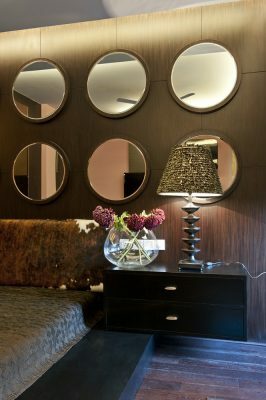 The set of mirrors on the wall above the bed becomes a winning touch; it balances the warm tone of the other elements of this bedroom. The lounge and adjoining dining area on the ground floor can host smaller informal get-together. More bedrooms follow on the first floor. The top floor is composed of the bar, spa and garden area. In spite of these varied areas, movement is fluid and spaces flow into each other. Each family member gets his own private area and several common spaces to use. Te bar on the top floor with its cosy fireplace is perfect for chilly evenings. It leads into a terrace garden which is a veritable haven for spending summer evenings and winter afternoons! The ground floor living room is apt for smaller get together while the formal living room in the basement can host larger gatherings. If required, all areas can be used simultaneously. In keeping with the clients sensitivity to energy conservations, solar panels, LED lighting and the VRV systems of air conditioning has been used. An organic herb garden and a number of varied plans become refreshing elements in the open spaces. 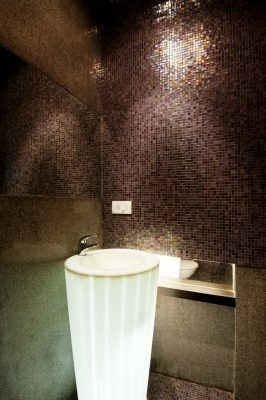 The designer duo has chosen to get creative with lighting. 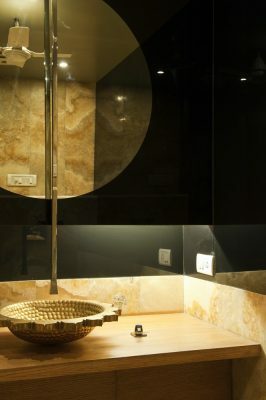 They have used up-lighters, spot lights, sky lights and uniquely lamps in relevance to the requirement of the area. 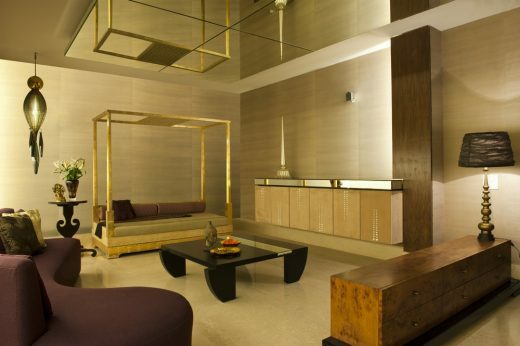 The mirrored ceiling in the formal living room is surprise element. 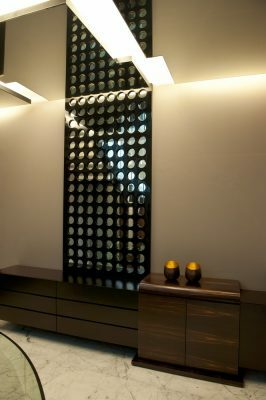 It looks stunning, visually enlarges the space and doubles the received lights. This is a clever touch since the basement area is devoid of any natural light. The day bed and cabinet present here are great conversation starters, easily adding a dose of understated elegance. 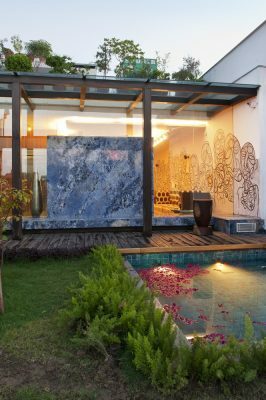 While we believe that things should look beautiful in a house, we also stress on ease of maintenance, says the designers. Rightly so, the staircase, which is the most used and abused area of any house, very easily practically maintenance- free. 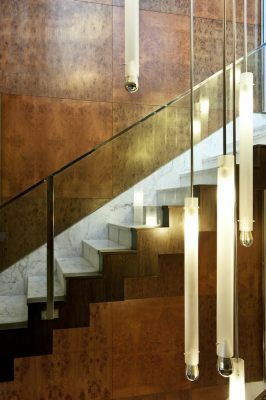 The mirror facades and cove lights illuminate the staircase warmly and require a minimum of effort in their upkeep. 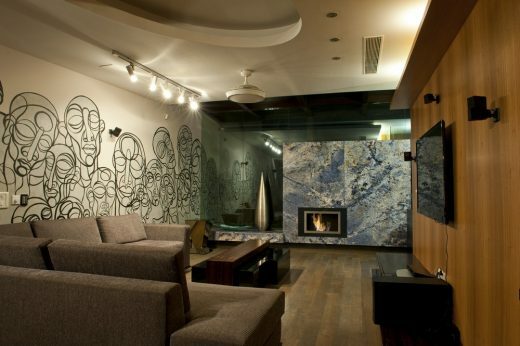 The wall to wall mural in the bar situated on the top floor was commissioned to a group of very talented artists. All the furniture was made in house under the designer’s supervision. 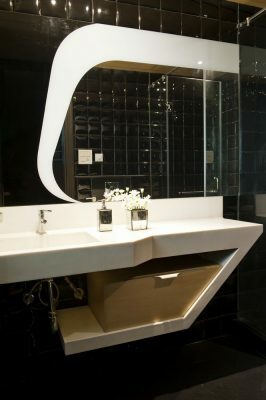 We find that glamour and lavishness abounds in the house, “it was a part of our brief “say the designers. . . The free flow of spaces, close attention to detail, exquisite craftsmanship in the design of seemingly usual objects and the use of luxurious materials, all add to the opulence factor. This has been achieved without compromising on the spaciousness factor. Indeed, the designers have created something very unique and noteworthy and it very easily rests on the tro-pillars of “Identity, Poise and Glamour”!